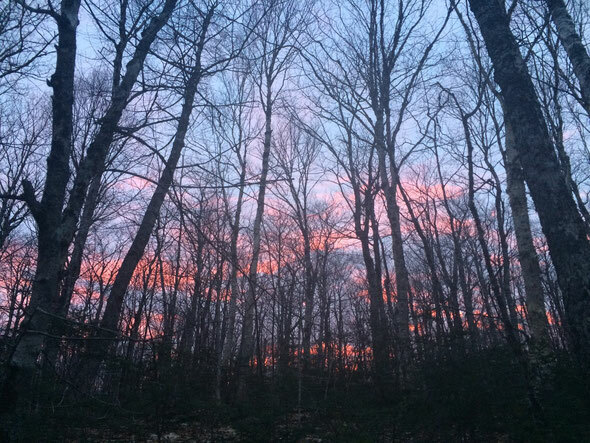 Spring sunset in the sugar woods. 9:50 pm Monday We had a great day Saturday! 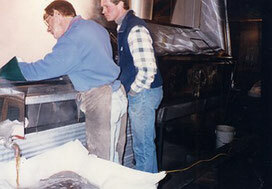 Lots of visitors, tours, sugar on snow, and a productive boil with Bob and Scott. Wrapped up with a little stream of sap coming in. Then Sunday hit. We received over 22 cm of snow here, plus drifting. We couldn't open. Had a quiet day at home. Today the sun was back and so was the sap! Ran nice and clear this afternoon so Scott is collecting. He'll see how it looks tomorrow and, unbelievably, potentially do another boil. This has GOT to be the last one...?? 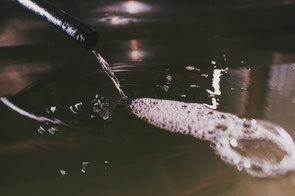 4:00 pm Friday As expected, the sap ran all night and we collected a tank full, with sap trickling in the other. Boiling now! Not as big a run as we'd hoped - if it had been, we would likely have been boiling last night - but we are grateful for every drop. Scott and Christopher are cleaning up that one tank. When he gets home, we'll know whether we collected enough for a boil Saturday. Boil #12 I think. Woohoo! Syrup is dark, end of season flavour, for those folks who have been waiting for it. Update @ 9:55 pm Sap's still running. 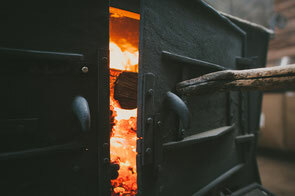 We're boiling tomorrow, firing up at 11:30 am. Scott figured that one tank would be full by 5 am, so he'll slip down and change tanks. 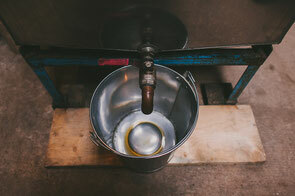 We'll boil til the sap's gone! Lucky 13. 8:45 pm Thursday Cold temperatures all week have meant that the trees were frozen and not giving us any sap. Today, however, the weather was warm and tonight rain is setting in. Heavy rain tomorrow. When Scott checked the sap at around supper time, it was just trickling. Did this mean that the trees have not fully thawed after this cold week? Don't know! We'll have to check tomorrow morning. It's nice to get this mild weather after three days of freezing temperatures. Here's hoping for at least one more boil! The trees have not budded up here...so the next few days could be interesting! 10:35 Sunday Another good day. 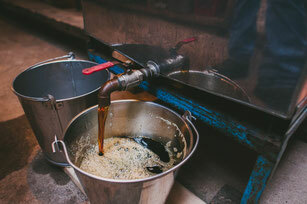 Boiled off a tank of sap. Made darker syrup but still mid-season flavour. Cleaned up all the sap. A pleasure to have Bob here again! Answered some questions about sap and remembered checking the sugar content of individual trees on the farm, comparing year to year. Tonight is supposed to be minus 14. Light snow on the ground. The next couple of days will be cold, with more snow expected on Tuesday. No sap will come until it warms up again. Sounds like maybe Thursday. The rain should bring sap. Lots of happy visitors from all over - Australia, Ireland, Philippines, Brazil...and then Rawdon Hills, Cape Breton, Moncton, Halifax and more. Tours, sugar-on-snow. Even Samara pitched in and was welcoming visitors. Great day all around! 10:40 pm Saturday Great day today, boiling with the rain coming down on the metal roof. Made excellent mid-season syrup. Left a tank of sap to boil tomorrow, Sunday. We'll fire up at 11 again, Bob and Scott. Come on up! Firing up Saturday + Sunday! 8:30 pm Friday The plan is to boil tomorrow starting at around 11 am. Bob will be here. 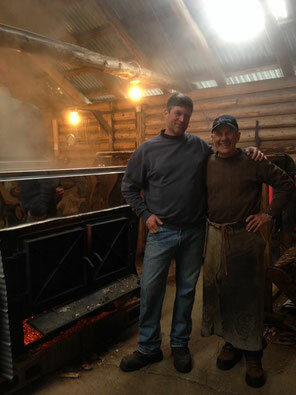 He taught Scott how to make syrup over 20 years ago. It will be great to have him firing! Then Sunday we should do it all again + clean up whatever sap we collect over the weekend before the minus 10 temperatures Sunday night. 4:00 pm Thursday Boiled yesterday, Wednesday. Scott and Christopher fired up at around 1 pm. Boiled til after supper, left with the sap running a little. It ran a little over night, and is running really well right now. We'll probably boil tonight. Better than boiling in a rainstorm tomorrow! So far this season we've boiled 7 times and have made about 60% of an average crop. Great, considering we like to boil at least 1/2 by the end of March. We're right on track. Pretty cool to have 5 year olds from New Glasgow Academy yesterday - they had such great questions, ate pancakes and maple syrup and went for a romp on the trails. Then the Grade 2's and 3's came today. Lively, excited group who loved the pancakes. And then listened extremely well when we stood under the sap tanks so that they could hear the sap running. We love schools! Tomorrow it's French Grade 9's! 9:45 pm Tuesday Great night of boiling til 1 am for Scott, Christopher and daughter #2, Kalina, home from Canmore for a visit. 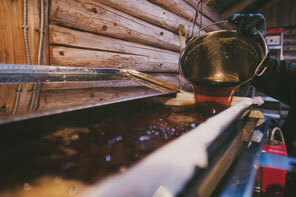 Warm temperatures overnight meant more sap; it filled one tank before things got cold around noon and froze up. Tomorrow Scott and Christopher will be back at it. Temperatures look pretty warm these next few days. Should bring more sap, but how long will it run? We'll see! Still making great tasting early mid season syrup. Meanwhile...Samara's still recuperating. Went for a walk finally today! 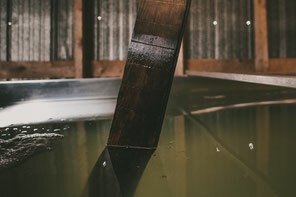 sap's running + we're boiling! 7:10 pm Monday Finally collected enough sap to boil! Christopher and Scott are fired up and ready to go for a few hours. Tomorrow's supposed to be messy. We'll see how long they have to go into the night! and still needing warmer weather! 4:45 pm Sunday A raw day Saturday meant no sap. Today has been nice and sunny this afternoon but still the sap is just trickling. We're waiting patiently. In the meantime, we've had a great weekend with lots of visitors! We'll post here just a soon as it looks like we'll be boiling. 9:55 pm Wednesday It's the "sugar moon" tonight - the full moon during the maple season. 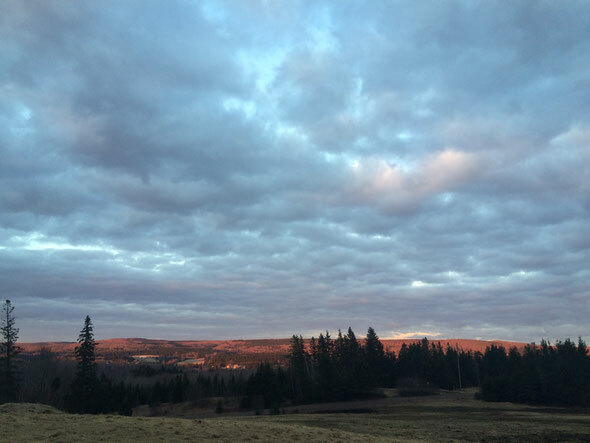 Time to give thanks to Mother Earth for her gift of sap. Folks have been emailing or calling and asking if the "tapping" is over. Yes, the tapping is done. It's the first step of the sugar season that involves drilling a fresh hole in each sugar maple and gently tapping a spile into the hole so that we can collect the crystal clear sap. The maple season is well underway. But from our viewpoint, there is lots of season to come. 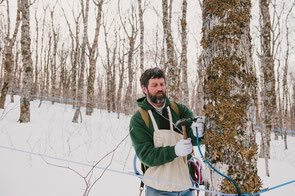 The sap will make great syrup as long as the trees don't bud. And forecasts indicate that budding might not happen until well into the middle of April. We've boiled 6 times. We're expecting quite a few more. 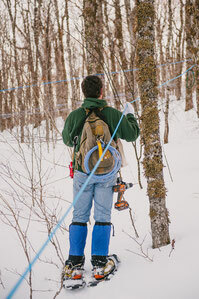 We're waiting for warm temperatures to thaw the trees so that the sap will run. 12:30 pm Tuesday Need warmer temperatures! 9:35 am Scott reports that we have enough sap to boil tomorrow, Friday. 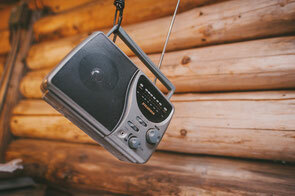 We'll fire up mid day with Bob Williams back firing. Yay! 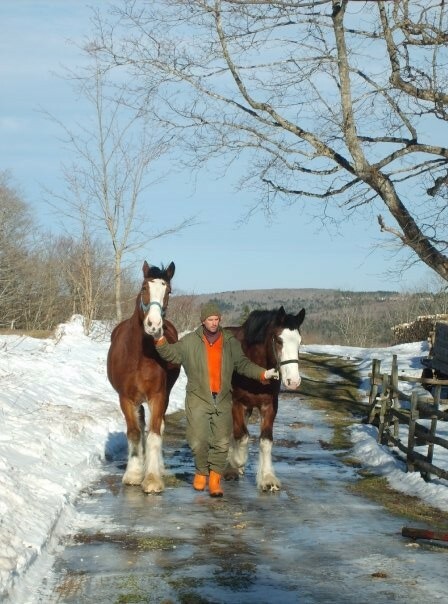 Bob is the original owner of the farm, the one we apprenticed with back in 1994. He's freshly back from a cycling trip through Mexico with his partner, Glenda. Look forward to boiling with them at some point every year. Won't be a long boil. 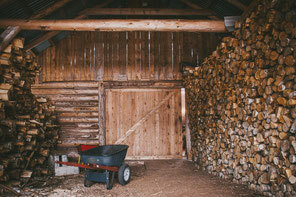 The temperatures need to get a lot warmer for us to get sap. Saturday we have CBC coming here for the day...including Daniel Tiger! And...the happiest of birthdays to our Sugar Man, with love. 9:10 am Kept waiting for something to happen, and nothing did. Temperatures did not get warm enough up here. The winds were bitter cold yesterday! Last night got down to minus 10. Sun out today...but will it get warm enough? 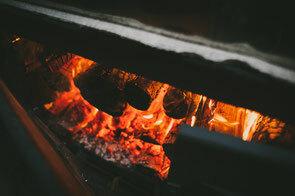 We'll be busy with March Break and hope to be boiling at some point! 9:25 pm Well, so much for the forecast. The temperatures up here never got any "warmer" than plus 2 Wednesday night, and by 7 to 8 am Thursday had fallen to minus 3. Needless to say, we didn't collect much sap at all. Now we'll see what the weekend brings...or not. On a more positive note, we sure had a great day of schools here: Grade 8 French students and International students from Pugwash and special students who came all the way from the Annapolis Valley. Homework for the Pugwash kids: find a sugar camp close to where you live and go visit it! Maple candies as prizes for the first three. 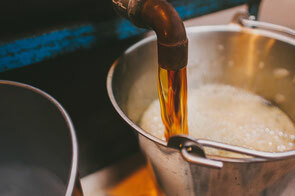 10:15 pm Fired up at noon and after a six hour boil that included dealing with frozen sap in the tank and equipment malfunctions, produced a good amount of early-season syrup. There's still a lot of ice in the tanks. Next run? Might be tomorrow night but it depends upon which weather forecast is right. Snow, then ice pellets, then rain and temperatures not going below freezing tomorrow night is what they agree on. As usual, we have no idea what will happen! But it's a better spring than last year! Bring it on. 8:00 am Good snowy sunny morning! 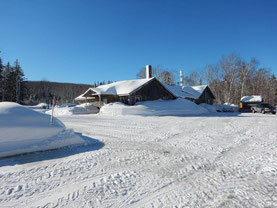 We're plowed and open and ready to have a happy busy day with sugar on snow, snowshoes, tours, and pancakes. Sap? We've got one and a half tanks of frozen sap that came down the hill after our last boil and it's been too cold to boil. 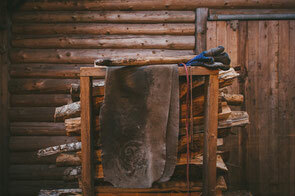 Can't manage the sap and the evaporator effectively when it's really cold. Looks like good sugaring weather coming up this week, though. We expect we'll get some sap soon enough - maybe Monday. The ups and downs of temperature this week should be perfect...although one never knows. Up here in the "mountains" temperature are always cooler. Cross your fingers! 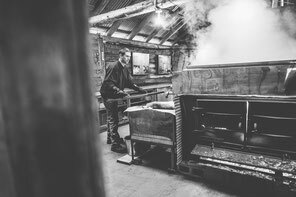 We'll take bookings on Thursday + Friday this week (Maple Magic) if you want to beat the crowds. Same thing during March Break. 8:20 pm Awesome run and boil today! Scott just got home. Cleaned up the tanks and left with the sap running hard - about 10" an hour. A bit of supper and then back down to check again. It's supposed to get very cold by around midnight, gradually dropping to minus 7 by around 1 am. So the sap will slow and eventually stop. How much will we have in the tanks tomorrow? Don't know. We do know that they'll be back at it tomorrow. Samara? She had enough energy to actually play this afternoon for about 30 minutes, but it wiped her out and her fever's back. Poor kid! Just keeping her on miso soup, apple juice, Vit c suckers and...mac and cheese. Christopher's little girl is sick too. Guess it's going around. Storm coming this weekend. We'll see what conditions are like for Saturday - call our toll free line first before coming up to make sure we're open! 12:00 noon Scott's heading down to the sugar camp shortly to start boiling. Christopher Howse is firing for him today - yay! Scott's starting with a full tank of sap and then it's supposed to get pretty warm and rainy this afternoon so potentially the trees will open up. Could be a boil into the early hours, until the rain turns to snow and the trees shut down. Then tomorrow is cold again so it should be quiet. We've made about 10% of an average crop so far. Thinking of all those producers who still aren't tapped in yet and hoping it goes smoothly for them. This is such an early season. We're doing a lot of "maple magic" packages this year - a reserved all-inclusive package during the week. Very fun, cause those folks are booking an over-the-top brunch, guided tour and sugar on snow by reservation. It means that during March Break folks are booking Tuesday thru Friday. Staff limitations/availability will determine whether we can also take drop-ins. Samara's on day #6 on the couch and is finally close to well. Happy spring! We had a relatively cold night last night - minus 3 - and it's plus 12 here at Sugar Moon, but the sap didn't run all that hard. We have a little bit to boil off sometime later today or tomorrow. Send healing wishes to couch-bound Samara! She's on the mend! Boiled Friday. Made syrup. Quick boil because there wasn't much sap overnight. Had to clean it up because of cold temperatures coming Friday night. It would have frozen in the tank. Not the end of the world, but not great for the next boil as it would make it a bit tricky. So we have fresh maple syrup in our coffee this morning. And sickness in the house, as per usual at the start of sugar season. 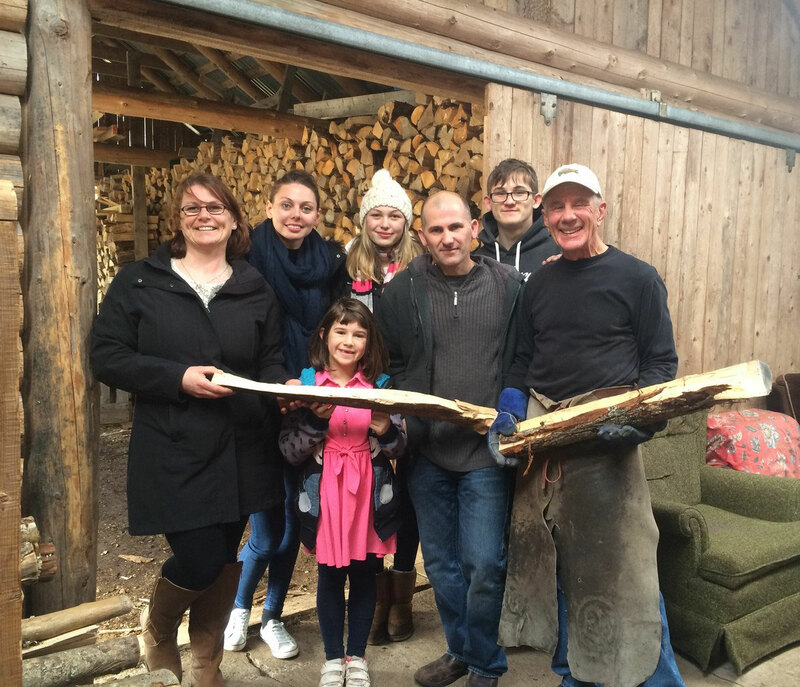 Juggling family, the need to finish tapping, the tours booked at the restaurant today. All part of the sugar season. Today's the first all-day sugar-on-snow. Maggie will be there boiling and pouring the sticky goodness on crushed ice. Derek will be learning. Say hello them! Woohoo! 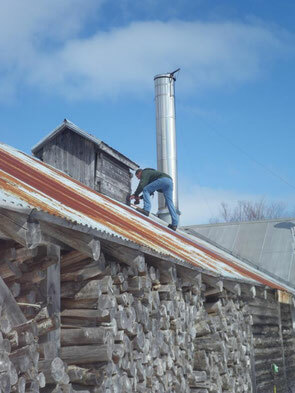 Sap ran well all day and Scott's doing the "priming" boil right now. 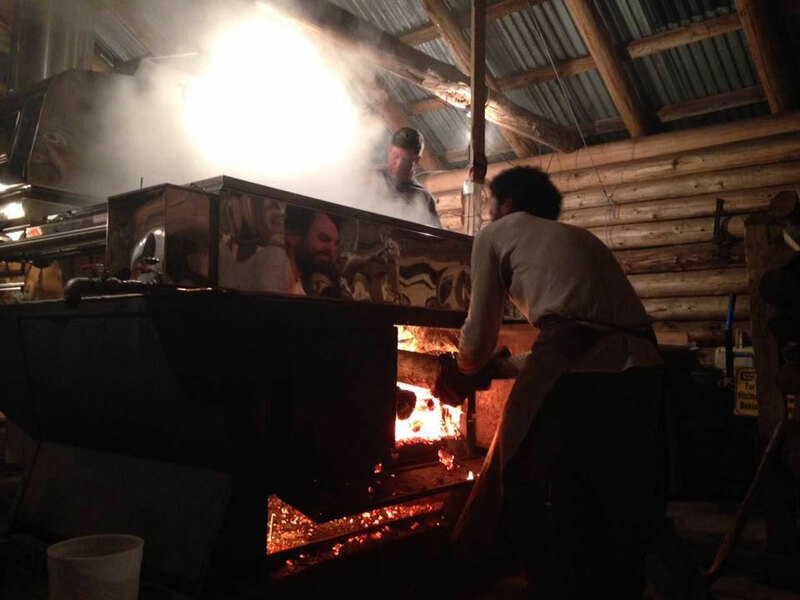 That means we put around 150 gallons of sap into the evaporator, light the fire and boil for about 4 to 5 hours. At that point, the evaporator is ready for the season and we'll start making maple syrup. Don't know at this point how much sap we'll get. Last I heard, it was slowing and should stop over night with the cold temperatures. Will update later! 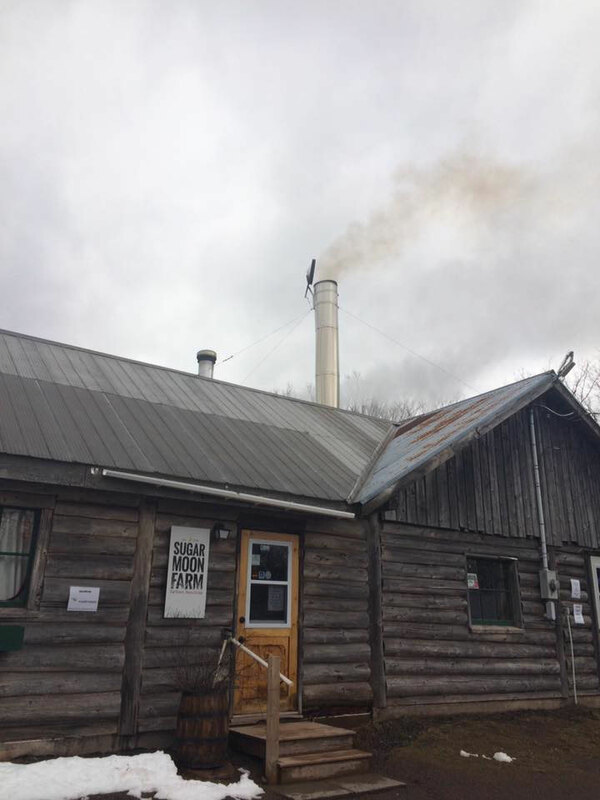 Steam stack's up, sugar camp's ready for a boil. Craziness, this season. 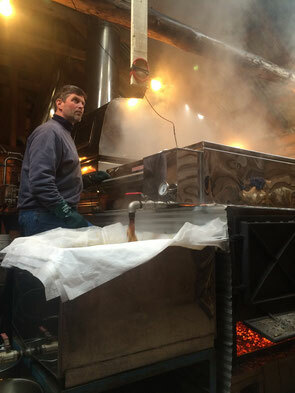 Scott says this spring is the earliest he's experienced in 23 years of making maple syrup. And last year was the latest start. April 11. 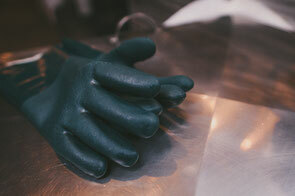 We're not fully tapped in, but tomorrow will bring sap and we'll want to be ready to boil. 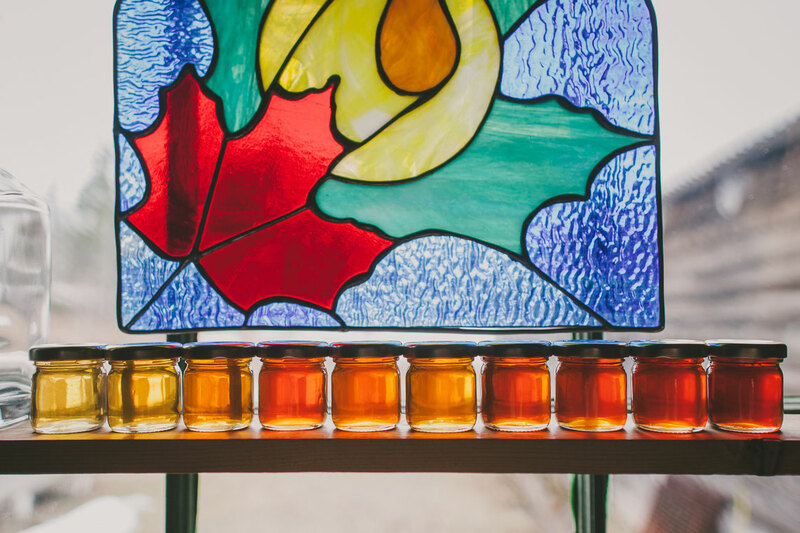 Our neighbours, Maple Mist, have made yummy syrup already. So there it is...an erratic but early start to spring. Winter's over folks! So is it spring yet? Yup! 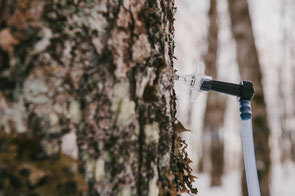 The sap's been running in various spots around Nova Scotia. Is it running here at Sugar Moon? Not really...although it probably did a week ago. Sounds like it will really be the first run for us later this week, with the rain that they are predicting. Scott is racing the weather at this point. He was up tapping most of today. A few snags in the process but otherwise fairly smooth. When will the first boil be? Depends on when we're finished tapping and when the sugar camp is ready to go. It's a bit early this year so we're trying to get ready quickly. Long range forecasts are....interesting. How will this season go? Ask us in May. A great day of tapping. Good conditions. He's almost 50% done. Scott started tapping yesterday! Finally temperatures warmed up enough to get to the woods. He doesn't like to tap in colder than minus 5. So far so good...apparently he's 25% done. There's still lots of snow in the woods - he's on snowshoes. Pretty good conditions though - firm snow and cold. Sure better than last year! 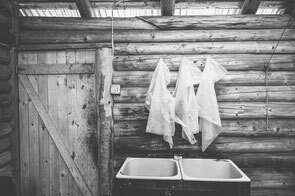 Things are hopping at the restaurant and sugar camp down the hill - we're gearing up with new staff and welcoming back returning ones. First school booking was this week - the whole Scotsburn Elementary School. 100 children learning about maple, eating pancakes and maple syrup, listening to stories, rolling their own sugar-on-snow and hiking in snowy woods. Lots of the kids had made their own syrup before. Gotta love rural kids!